Republican president candidate Donald Trump’s interview with Larry King, which aired on RT America Thursday night, is fueling the flames of growing US propaganda against Russia, even within his own campaign. Not only did the US media turn the conversation into another chance to advance their conspiracy theories, but Trump’s own campaign distanced itself from the Russian news channel following the backlash. His press secretary Hope Hicks said in a statement that Trump “recorded a short interview with Larry King for his podcast as a favor to Mr. King. What Larry King does with the interview content is up to him. We have nothing to do with it." Could be true Trump thought he was on Larry King podcast not Russian TV. I once ate snow cone and thought I'd climbed Mt. Everest. 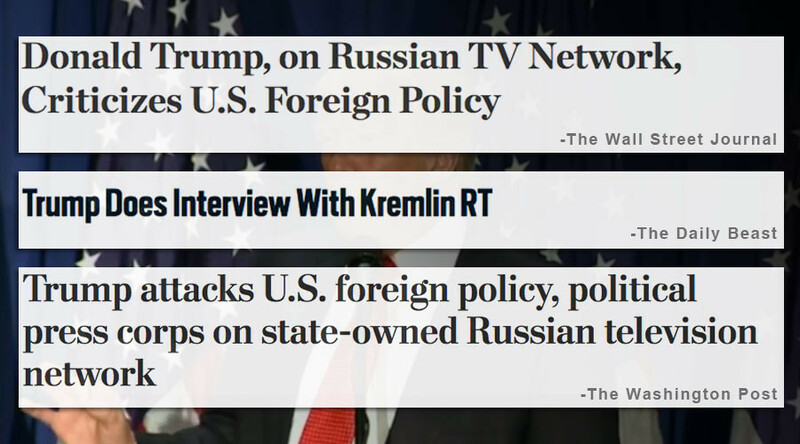 “Trump Does Interview with Kremlin RT” was the headline of an article by the Daily Beast, painting the picture of Trump flying to Moscow and sitting down in Vladimir Putin’s official residence for his interview. The Daily Beast is owned by IAC, which pays Chelsea Clinton, the daughter of Trump’s Democratic opponent, $50,000 per year plus stock options to be on its board of directors. The Wall Street Journal, which is owned by another Trump critic, Rupert Murdoch, described RT as the “Kremlin’s propaganda tool” and “a television network controlled by the Russian government,” again sidelining any mention of what was discussed until later in the story. Members of Trump’s own party have expressed concern at his Russian connections, including the billionaire’s praise for Vladimir Putin, when he described him as a better leader than President Barack Obama. Statements made last night by candidates -- we will never send another US soldier to Iraq/Syria & Putin is a great guy disturb me greatly. Republican vice presidential nominee Mike Pence echoed Trump’s opinion of Putin, telling CNN on Thursday, "I think it's inarguable that Vladimir Putin has been a stronger leader in his country than Barack Obama has been in this country. And that's going to change the day that Donald Trump becomes president." On social media, the content of the interview, even Trump’s mysterious dodging of the question on Mexican immigration, was also overshadowed by the 800lb Russian bear in the room, with many amazed that an international news organization is covering international news. Trump going on Russia Today & saying the Russians aren’t meddling in our election so proves there’s nothing to worry about.